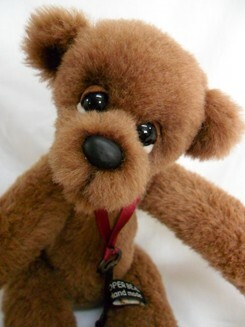 Although originally from Cheltenham England, Kay Cooper of Cooper Bears has lived most of her life in Australia. 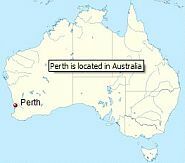 She currently lives in Perth, where her family owns a small crafts and bears shop. 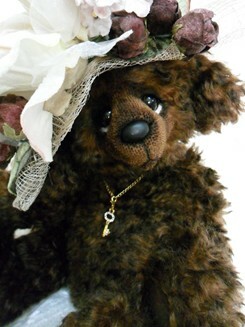 "I had always wanted to make bears, but was too afraid to spend the money, in case I messed it up," she recalled. But her husband, Brian, bought her a kit and told her to just go for it. "I was totally hooked and that was about 20 years ago." 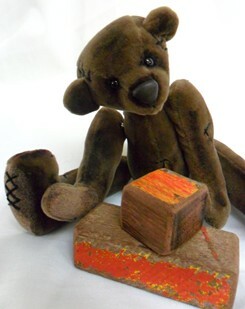 Along the way, Kay had wonderful teachers that helped introduce and guide her through the world of teddy bear making. Practically devouring patterns from other artists to learn as much as possible. 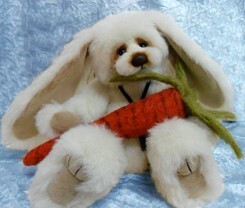 Kay has been designing her own cloth dolls years now and finally, after much encouragement from her family and friends, began to pursue her dream of teddy bear artistry. 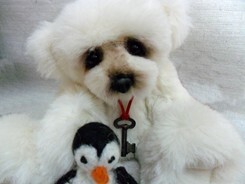 "I sell my bears online. at the craft fairs and in my own shop." She attends shows in Western Australia and has plans to travel to Melbourne next year. 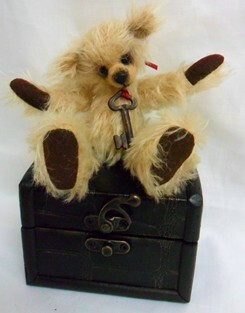 She also is working hard to further perfect her bears and hopefully be able to travel overseas to shows. While making a living operating her craft shop, Kay still finds time to design about 10 different bears and buds each year. 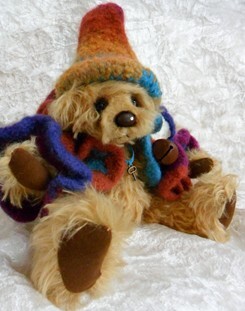 She enjoys using a variety of furs and combines many to create her style of bear. 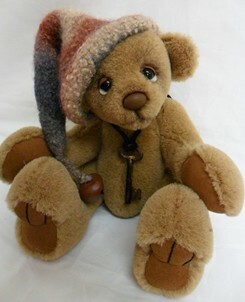 At the moment Kay makes 1 to 2 bears a week along with an occasional doll. "Not sure if I can do that every week, but bear making is my 'happy place', so I can't exactly say how many I make a year." 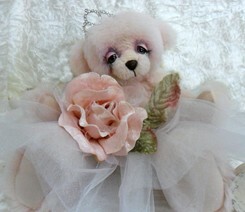 She is best known for bears that look a bit sad in an antique fashion, with attention to the eyes and the clay noses. "My favorite technique is polymer clay noses. I love them and since I'm not brilliant at doing embroidered noses, it's a great option instead." Another technique she's learned over the years is to slow down and finish the bear she is working on. "A bear is not finished until it is finished. In the past I have designed bears and not carried it through to the end. I think it was from lack of confidence. I just didn't think they were good enough so I would give up on them." Her advice now is to "walk away for awhile. It helps clear your head and gives you a fresh perspective when you return." Now she pushes herself to achieve more; even teaching bear making classes at her shop 3 times a week! 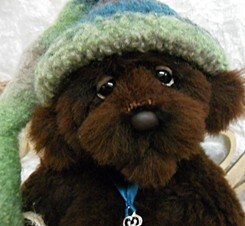 "I think the best thing about bear making and this friendly community that is unlike any other craft community. 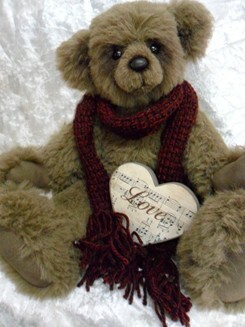 Bear makers are such nice and kind people. They are so helpful and encouraging. Our collectors are loyal, wonderful people that are always ready to praise us and have been incredibly supportive." Kay still feels new to the bear world even though she's been making them for a long time. The choice to pursue Cooper Bears as a serious artist had been a long time coming and a dream she had as long as she can remember. "I feel so honored that people are liking my work and I feel like I am at the beginning of a wonderful new journey!" Collectors - one year subscription to Bears&Buds is just $15.00 and you'll receive a password to enter the Collectors' pages. Artists - become a Member of Bears&Buds today! Advertise FREE! Password will take you to the B2B section loaded with selling, making and how-to build your business ideas.